Hello from Texas. We had a great trip down with no weather problems of any kind. Never having driven this far south in November, I paid particular attention to the changes in the weather, and of course, the birds. The daytime highs of the low teens (in places) and lows (near freezing) did not vary that much from home until we reached Austin, TX, where temperatures started to rise above that. In Weslaco the temperatures have been in the mid to upper 20sC. From Foam Lake to Minot, ND, the weather was consistently a few degrees above freezing in the daytime and a few degrees below freezing in the nighttime. With the exception of large bodies of water, all the sloughs and potholes had a thin layer of ice covering them with the resultant lack of water fowl. After crossing the Continental Divide between Minot and Bismarck, the weather seemed to be the same but the small sloughs were not frozen over. Perhaps the nighttime temperatures did not drop as low as they did just a little further north. In any case, geese, ducks and coots were plentiful. From southern South Dakota to Nebraska, Red Tailed hawks were everywhere. Red Winged Blackbirds, Kestrels and Mourning Doves were still in Nebraska awaiting the colder weather before migrating further south. Once we got to Oklahoma, Turkey Vultures and Crows were common. Incidentally, the state of Oklahoma and adjacent territories are the wintering grounds of the crows that breed on the prairies in the summertime. Once we got to Texas, we started to see birds that are representative of that part of North America. A few representative species were Caracaras, Chachalacas, Green Jays, Kiskadees and White Tipped Doves to name a few. This week’s featured bird is very common in thickets around here, but is not found anywhere else in North America. This drab little Mexican bird is the Olive Sparrow, so named because of its overall colour. Although common, it is not easily seen, because it is a ground feeder that is constantly in motion searching for food under brush and deadfalls. Trying to spot one is like trying to spot a mouse. Though not easily seen it gives its position away by its song during the breeding season. Its song is a series of chips that start of slowly and quickly speed up ending in a crescendo much like a dropped ping pong ball coming to a stop. This week’s picture was taken from a blind near a water feature. Even so its furtive nature resulted in only one good photo out of many taken. Enjoy. The last of the summer birds are now completely gone, but with the onset of unseasonably warm weather the winter birds are still up north on their summer grounds. However quite a few summer residents that have spent the breeding season away from towns are now active in our yards and can be attracted to feeders. 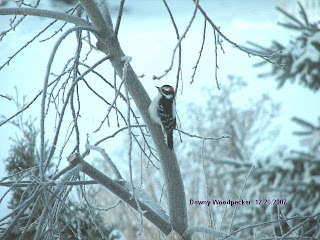 Downy and Hairy Woodpeckers, Red Breasted and White Breasted Nuthatches, Black Capped Chickadees and the ever present House Sparrows are regulars at our feeders already. It is interesting to watch them fly from feeder to feeder picking and choosing what appeals to them at the moment. Ravens and Magpies have been in our yard, but appear to have ignored the feeders. In this article I will go into some detail about the different types of feed that can be used to feed seed eaters. There certainly is a wide variety. Some grains have a lot of appeal to many different birds; some appeal to only a few; others have very little appeal to any birds. The answer is to have several feeders with a variety of feed. Stores usually have a good selection of bird seed some of which is quite expensive – seeds that birds like. Local farmers often grow crops that can be used as bird food and usually the “price is right”. The most common seed found in stores is usually labeled as mixed wild bird seed. The bags are clear plastic embellished with pretty pictures of Cardinals, Blue Jays and Goldfinches to name a few. The contents are a pale yellow mixture sprinkled with some black oil seed. The main component of the feed stock is millet with lesser amounts of canary seed, cracked wheat and black oil seed and a few others. Although this particular feed is cheap not many birds in our area will touch it, with the exception of House Sparrows. Even so, the sparrows will scatter the millet and canary seed in order to get at the black oil seed and cracked wheat contained within. Sunflower seeds are a great favourite for birds of all kinds including some insect eaters. The smaller dark version of sunflower seeds, usually referred to as black oil seed, is preferred by most birds, but not all. A few birds prefer the regular seed, so a good strategy is to provide both. Both of these seeds used to be quite cheap, but with increasing numbers of people feeding birds the demand has gone up and so has the price. Unquestionably, the all time favourite of seed eating birds is black thistle seed generally referred to as niger or nyjer seed. As with sunflower seed it used to be cheap, but has gotten very pricey. Birds will eat many dollars worth in a day so some sort of rationing is necessary. More on this and other related matters in the next week’s article. The last three varieties are canola, canary and wheat. In my experience no birds are exactly crazy about any of them, but all three are slowly consumed over time. Wheat has to be cracked into smaller bits. Red Polls actually seem to like canola over nyjer. All three can be obtained from local farmers and usually at a very “favourable price”. 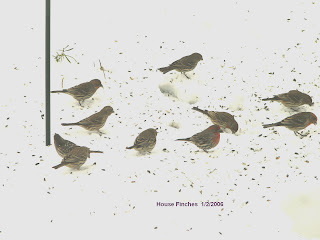 This week’s photo is of House Finches feeding on seeds spilled from feeders onto the ground (snow) below. White Crowned, White Throated, Harris’s and Lincoln’s Sparrows will clean up under the feeders in the spring while House Sparrows and Red Polls will do so in the winter. 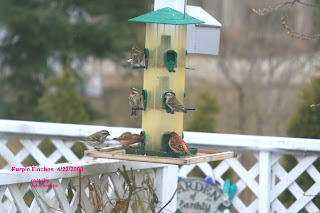 All of these birds prefer to feed on the ground but will use feeders if they have to. Thus, spilled bird seed is not as wasteful as it first seems. Even so, hanging feeders over a flower bed is not advisable as the shells of sunflower and nyjer seeds can be a problem. As of this writing, the warm weather continues and the birding scene has been holding steady with only permanent residents at our feeders. Soon the weather is bound to change and with that change some winter birds will be here. It is just a matter of having the feeders ready. Getting a variety of birds to come to feed in one’s yard can be very simple and inexpensive, or more sophisticated and, therefore, more expensive. Feeders can be very plain or fancy with prices to match. It should be kept in mind that none of these things matter to the birds. All they want and need is some good and readily available food to eat in relative safety from predators. There is nothing wrong with having pretty feeders, but it should be kept in mind that this strictly is for the benefit of us and not the birds. The easiest and cheapest way to feed birds is to simply sprinkle some seed on the ground or snow since most seed eating birds like to feed near or on the ground anyway. The negative aspects of this method are that seeds have to be replenished (by hand) much more frequently, and feeding birds are much more exposed to predators – particularly cats. To get around this problem one should use a wooden tray, with some sort of roof over it to protect the seed from the elements, and then mount the device on a post. The cheapest commercial feeders, and the most common, are the clear plastic tubes with top and bottom closed. Several small holes are drilled into the sides with perches fixed just below them. The bird sits on the perch, reaches into the hole and picks out seed. By using tubes of varying diameter with different sized holes, just about any seed, from canola to sunflower, can be offered. The plain and simple tube described above does have one major drawback – many different birds can utilize it. When expensive seed, such as nyjer, is used cost can become a concern. Birds such as House and Purple Finches are large and can clean out a feeder of nyjer seed in a single day – sooner if the flocks are larger. 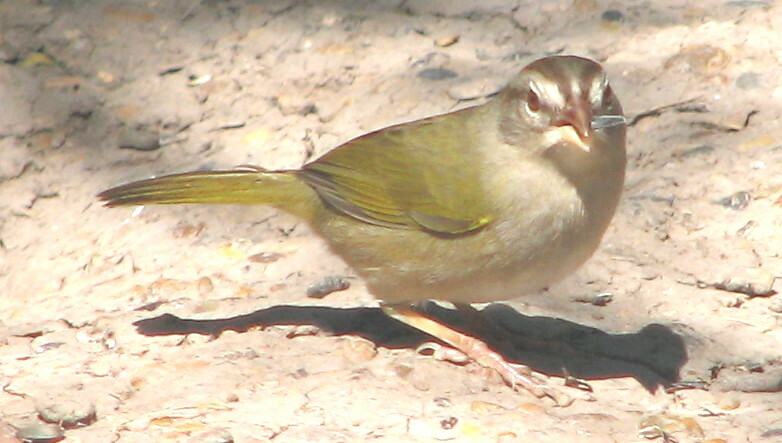 To reduce consumption, a variation of the common tube type feeder, often called a finch feeder, can be used. This feeder has the perches (pegs) above the seed holes thus forcing the bird to hang upside down to get access to the seed. Only Siskins, Goldfinches and Redpolls (carduelis finches) have the necessary leg strength to do this. (Chickadees and nuthatches also can hang upside down, but do not care for nyjer seed). By eliminating larger birds in this manner, consumption of expensive bird seed can be reduced significantly. The “eliminated” birds will still visit our yards to eat the other seeds – especially sunflower. Another common feeder that can even be made at home if so desired, is the hopper and tray type feeder that slowly lets seed out the bottom as quickly or as slowly as the birds consume them. This type of feeder is very good for dispensing sunflower seed. Finally, bird seed is oftentimes stuck together into a cake or bell (much like rice crispy cake). The bell shaped ones have a cord attached to them so the bell can be hung directly to a tree or pole; the cakes usually require a small wire cage to hold them in place. Birds readily feed from both. All feeders should be hung 5 to 6 feet above the ground and the area below the feeder should be clear and free of any plant material. This eliminates cover for predators. Feeders should be spread around one’s yard in order to reduce squabbling among the birds. These measures provide for better and more enjoyable viewing. 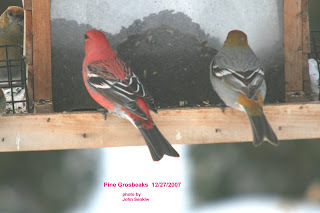 This week’s photos are of a pair (male and female) Pine Grosbeaks, in the winter time, eating at a hopper type feeder full of black oil seed and a flock of Purple Finches, in the spring time, feeding at a tube type feeder - also full of black oil seed. For the next three weeks or so, we will be away so my articles will come from Texas. When I get back, I will continue with feed and feeders.